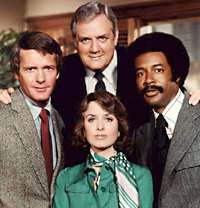 The late TV Guide critic Cleveland Amory wrote: Maybe every episode of "Ironside" isn't the best episode of "Ironside", but we watch it anyway because we love spending time with the Chief, Ed, Eve and Mark. I would agree that that is one of the reasons Ironside is a favourite of mine. I don't watch much regular programming these days. Do people still make a family of their favourite shows? I wonder what the betting was in 1967 that Raymond Burr could create another successful television character/series after the phenomenon of Perry Mason. I was ten years old at the time and I recall vividly the impact of the pilot movie for Ironside written by Collier Young, Don Mankiewicz and directed by James Goldstone. Quincy Jones' driving theme song, the flashy editing and, for me, exotic setting of San Francisco made for a collective wow! Confined to a wheelchair by a sniper, SFPD Chief of Detectives Robert T. Ironside investigates his own case, bullying the Department into creating a special consulting position for him and okaying his staff of Sgt. Ed Brown and Police Woman Eve Whitfield. Handsome Don Galloway (1937 - 2009) played Ed with a down-to-earth charm and easy-going professionalism. Devoted to the Chief and smart, in my mind he was the Archie Goodwin to Burr's Nero Wolfe-like boss. Barbara Anderson's Eve was a society girl looking for more in life and found it in a career. Classy in a Grace Kelly sort of way, she wore her heart on her sleeve and 60s fashions with elan. Don Mitchell was the icing on the cake as Mark Sanger, a young man with a criminal background who joined the family as physical trainer and assistant to the Chief. Most crime shows of that period didn't delve too much into the personal lives of our protagonists. The idea behind the shows was the crime and the solving of it. Most of the characters would not advance beyond their pilot blueprint. Audiences had the opportunity to see Mark grow from an angry young man to a struggling and confused law student, a rookie cop, and from a bachelor to a married man (lovely Joan Pringle). 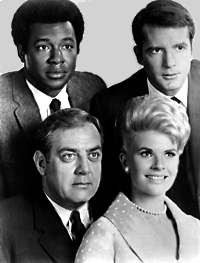 The format of Ironside gave the actors and guest stars plenty of range. What would it be this week - a caper, a murder mystery, a character study, something on the light side perhaps or international intrigue? Written by Ed McBain featured Eve in a heartbreaking story as she shoots a young thief. Ed Brown has an awakening to how cops treat the public in a tense episode directed by Raymond Burr. A very human story written and starring four time guest star Felton Perry. Vera Miles guest starred as an amnesiac romantic interest for the Chief. Jessie Royce Landis and Arthur O'Connell guest star as the Chief's aunt gets mixed up in murder. A love story for Fran guest starring Gary Lockwood and Mike Farrell. Mark is torn between childhood loyalties and the realities of his present life. The Chief creates a new family when he leaves the Force to find a criminal. Features a couple of songs by Marty Paich, who provided wonderful background music and tunes for a couple of years. In the 5th Season Barbara Anderson left the show and a new character came on board. Elizabeth Baur played Fran Belding. A cop from a family of cops. Good at her job, but like Eve, having to deal with the stigma of working in a man's world at that time. Fran was likable and wanted to please. She felt she had a lot to prove. An interesting spin-off was Amy Prentiss starring Jessica Walter as the first female Chief of Detectives. More well-done stories, but perhaps the world wasn't ready and the the show lasted less than one season (1974). George Kennedy's excellent but short-lived Sarge (1971) also spun out of Ironside. The bittersweet reunion TV movie The Return of Ironside aired in 1993, the year Raymond Burr passed away. The whole gang was there, Eve, Fran, Chief Brown and Judge Sanger. As with the Perry Mason movies completed at the same time, it must have been important to Raymond Burr to get the family together at that time. Years ago I saw Burr and co-stars Galloway and Mitchell in a stage mystery at the Royal Alexandra in Toronto called Underground. The theatre was filled with fans and filled with love. The first two seasons of Ironside have been released on DVD, but there is no word on when or if Shout Entertainment plans to continue the issue. Frustrating news for me and for Ironside's legion of fans. I took this quality series for granted. Burr always brought a touch of class. Ironside was my favorite show when I was in HS. I always thought Don Galloway was such a hunk - even wrote to him once and got his autographed photo (which I still have). I was saddened to hear he passed away this year. I am now re-watching S1 shows from Netflix. I've seen somewhere that S3 has been released in Australia and hope it makes it to the US soon. You and me both, Sher. Although I never thought to write for an autograph.